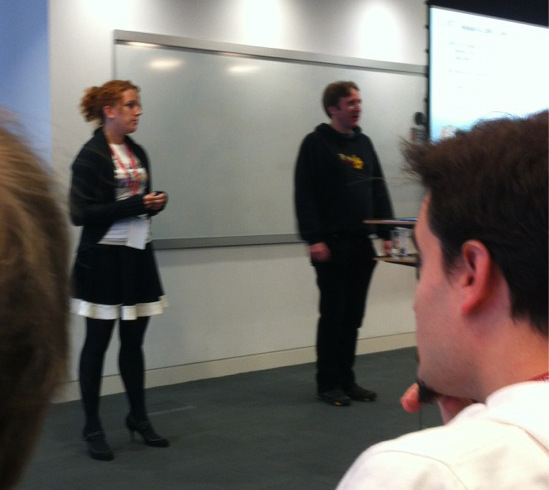 Saturday I had the pleasure of being part of the 5th London Java Community Open Conference. This is a great event to end the conference season on - it made me feel good about being part of the LJC, and got me excited about the prospects for 2013. The fantastic thing about an open conference is that a) you don't have to prepare like mad for it and b) the short sessions and wide variety of subjects mean that you learn stuff you didn't expect to. Given how much I've been presenting lately, and with the conferences piling on top of each other back-to-back leaving little time for preparation, I had decided not to speak at the open conference, but to sit and learn for a change - it's a great opportunity for new speakers to present for a start. But that resolution lasted all of 3.54 milliseconds. After all, if people don't like the sessions I propose, they won't come, so I lose nothing by suggesting some. First up, it was a very great honour to be giving my very first Keynote. Ben Evans and I presented on the State of Java - a summary of this last year from the point of view of our community and globally, and a view to next year. I know we've had an incredible year as the LJC, it was really satisfying to be able to summarise this for everyone there, to present what we've achieved locally and globally. 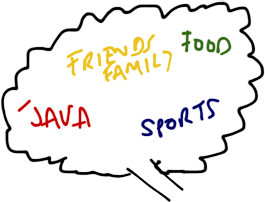 And looking forward to the future, there's so much more we can do as individuals trying to improve our skills (especially with Java 8 due), as a London-focussed community (with our own events, our sister communities, and with Devoxx UK), and globally (with the JCP and OpenJDK). Next, I was roped into a Java Performance panel, with the JClarity guys (Ben, Richard and John). I was surprised to see that not many in the audience were working on low latency systems - in London you'll frequently find a room full of Java developers who are all working in finance on things that have specific performance requirements. 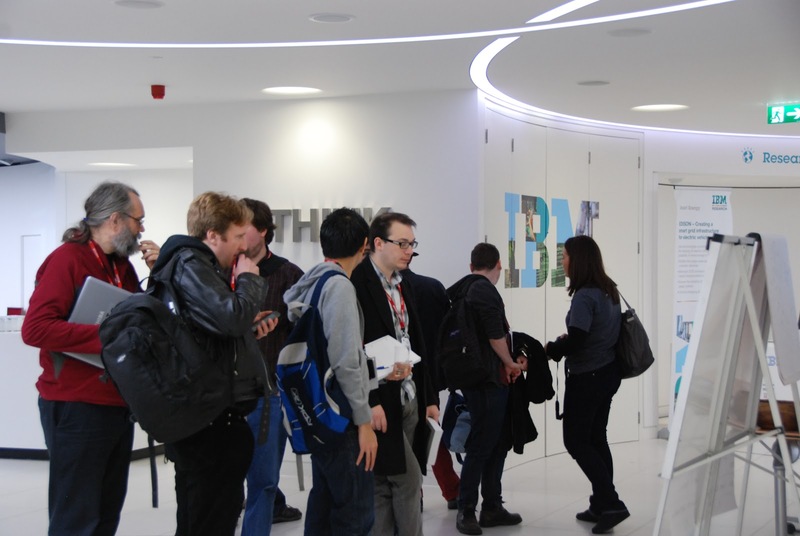 It was good that we had a this variety of developers, because it meant we covered a much broader range of subjects, and could discuss what to think about and where to get started when you're considering your non-functional requirements. Immediately after that I was on another panel, with some of the same suspects, talking about the LJC's involvement in the Java Community Process and the Open JDK. I really like these sessions because it's easy for us, who are dealing with these things at least on a weekly basis, to forget that most of our members aren't familiar with either of these two things. What's encouraging though is that after just a short introduction to what they are and how we can impact them, most people want to be involved in some way. 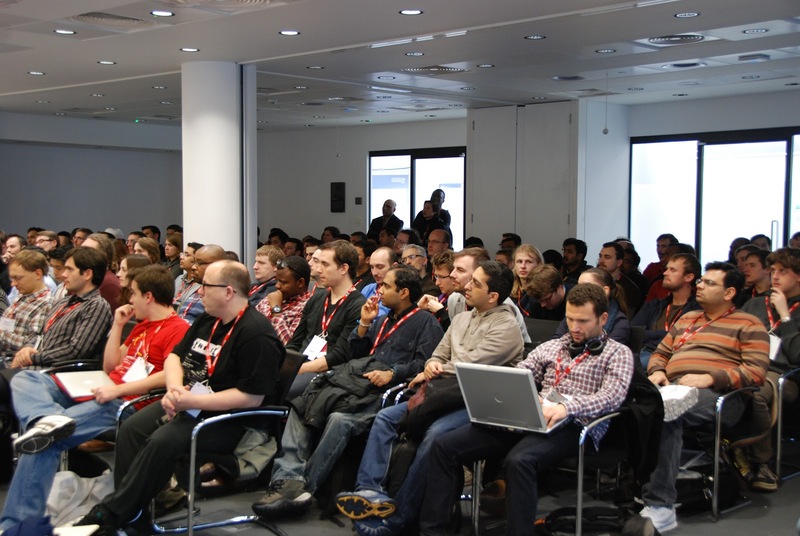 The hack days are particularly appealing to developers (not surprising). Although we've had a number of very successful hack days, we still need to work out a way to scale them - how do we attract more people? How do we make the best use of their time? 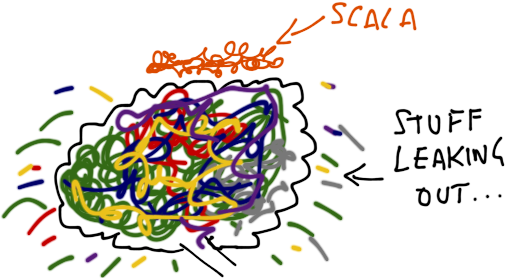 In particular, we need to work out how to cater for people with different timetables (weekends vs evenings vs week days), and how to handle the split between beginners and those who have already been to at least one hack day. I'm excited about what we've achieved so far with the hack days, but I think there's so much more that can be done. Over lunch there was a series of lightning talks. I really like the way the lightning talks are presented to everyone in the conference. I like the variety of topics, and I like that it's fairly easy for a new speaker to give a 5 minute talk, with as little or as much preparation as they want. The one I remember most was on software for elections from Alex Florescu - I thought that looked like an interesting (and difficult!) 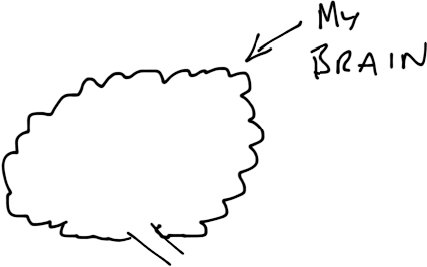 business domain, which needs novel solutions in order to get acceptance. Next up, I gave an intro to NoSQL From Devoxx, it was clear that while a lot of developers have heard of the NoSQL movement, and of databases like MongoDB, it's not clear to them why you'd chose these over traditional databases. Which is a relief to me, because that's exactly where I was three months ago. So this was a really quick (30 minute) overview of the different flavours of NoSQL, what they're good for and why you might pick one over another. 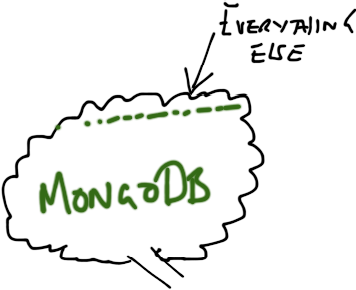 Obviously there was a focus on MongoDB, since this is the one I know most about, but I also covered the strengths of some of the others. I really enjoyed giving this session - the audience was perfect for the topic, the questions were intelligent and drove the direction of the discussion, and I had a number of positive comments from people who felt like they had learnt something. 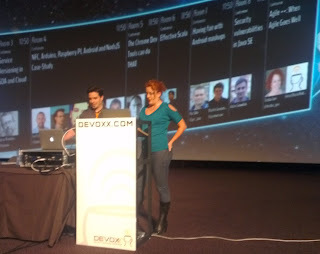 I gave another session which was a recap of the JavaOne and Devoxx "Problem with Women" talk, but even shorter. The fantastic thing about this was the energy from the people in the room - these guys like what they do and they're keen to tell other people how great it is to work as a developer. Finally, I managed to actually attend a couple of talks too. Barry led "Why is technical recruitment so broken? ", and we had some interesting discussions around the problems employers and developers face, in trying to get the right people into the right roles. Clearly there is no easy solution, and there's definitely a role for recruitment agents of all kinds in this space, but it would be awesome if we stop floundering around in the dark and actually be able to match the right people to the right jobs more easily. In seems to me that there is a huge educational piece here: developers can find resources around how to write their CVs, how to stand out from the crowd, how to network to increase their chances of finding a good job, but they need to know to start looking for these resources. Worse, though, is the problem of the employers - if you're a big company you have a non-technical HR department standing between the team needing a developer and the candidates themselves, and smaller companies don't have the time to invest in the hiring process, or going out and networking to meet people at things like LJC events. It's a tough problem, and one I'm extremely interested in. I'm hoping that the "Attracting Great People" track I'm running at QCon London will look at some of these issues, and give some advice from those who are doing a good job. The last session was an exploration of all that is wrong with Agile, led by Ged Byrne. It was an interesting discussion, the only disappointing thing about it was that everyone agreed with each other! Certifications Are Meaningless; external Agile coaches and consultants aren't necessarily invested in improving your business; a formal Agile process is really defeating the point; and, most importantly, let's try to remember the original agile manifesto. In summary, it was a really great day! I enjoyed it as much as I enjoyed last year's, for many of the same reasons - we have a fantastic community, it's a great event for meeting people, it's brilliant for encouraging new speakers, and if you are speaking you get much better feedback than you do at the large events, because you can involve your audience directly and give them what they really want. I can't believe how much I personally have achieved since my first solo talk at the LJC Open Conference last year, and I can't wait to see what the next year holds. 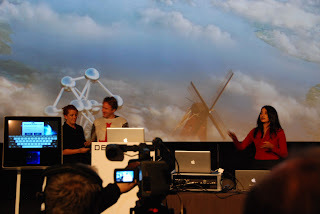 Devoxx topped off a crazy two months of conferences. I've heard people talk about the conference season in the past, and been slightly (OK, very) jealous of all that jet-setting. I'll admit, however, to a slight feeling of relief that my focus until Christmas is pretty much going to be coding. I hope. 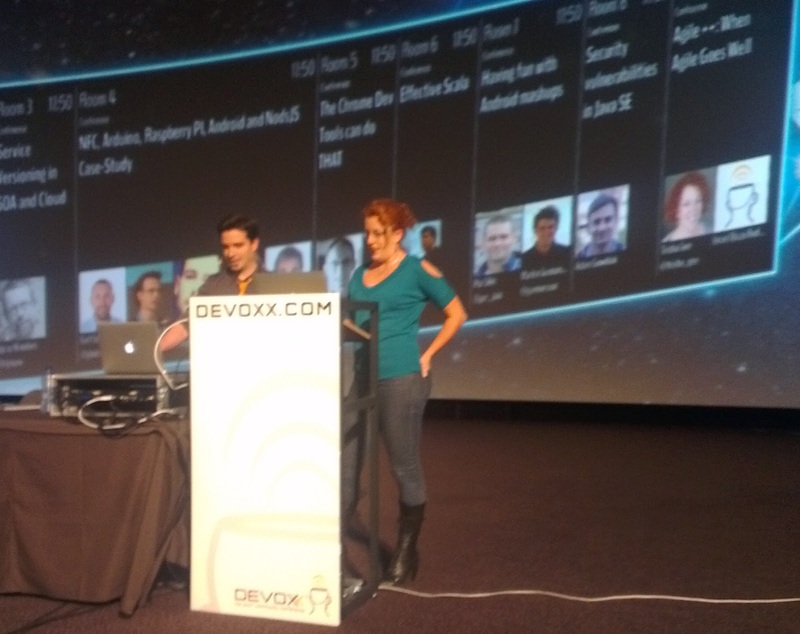 So, how was Devoxx? Well for starters, the calibre of the speakers and talks was excellent. I learnt things in every one I went to - either something I could put into practice at work, or something I could do to improve my own presentations. My favourite was Neal Ford's When Geek Leaks - Neal is a great speaker, and this talk was entertaining and informative. I'm also currently reading his Presentation Patterns book, which is extremely useful. Although obviously I give a bunch of presentations and have found some very handy tips in here, it's dead handy for everyone, even if you're just presenting to your boss or team at work. 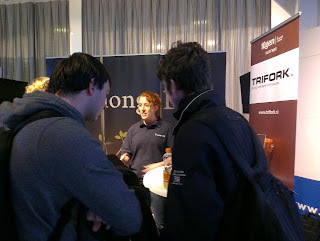 The great thing about Devoxx is being able to meet all the European-based people in the Java space. People fight to get to JavaOne, but Devoxx is a lot easier if you're based over this side of the pond. It's also easy to run into people in either the exhibition area (where lunch is served, so everyone ends up there at some point), or the central corridor between the rooms (which everyone has to go through at some point). It was really awesome to have so many people grab me either at the MongoDB booth or when I was sat at the desks in the corridor. I really like that venue for a conference, the only downside is the seats are so comfortable, people fall asleep in the talks. Even in our presentation (how rude). It was fun making a couple of guest appearances in the keynote, firstly as one of Stephen Chin's Nighthacking crew and then to celebrate the London Java Community being re-elected to the Java Community Process Executive Committee (with a massive 33% of the vote!). Another re-run of The Problem With Women. If anything, this went even better than when I ran it at JavaOne. What I really loved about the session is the sheer number of men who turned up. it's tempting to assume they're there to heckle, but in fact their active participation in the subject proves to me that the men in this industry are very much on board with trying to address the gender balance. As always, I have so much more to say on this subject, so I'll make a note to write a separate blog post. In summary, although there are differences in the contributions from the audience in these sessions, there are common themes and a willingness to get involved and Do Something. The exclusive premier of the new Agile++ talk, co-presented with a colleague of mine from LMAX. The aim of this presentation was to talk about where you go when your organisation starts with a great agile grounding - what problems might you face and how do you tackle them. Bit confusing for me giving this talk since I was still in LMAX-mode, and I'm very grateful to 10gen for not only allowing me to present this, but actually promoting it for us as well. I'd love to do this session again, I'd like to work out how to without having a split personality as an LMAX person and a MongoDB person. Not everything can go swimmingly, so I should probably make an apology for giving the Shortest Talk Ever on Wednesday. It was supposed to be a 20 minute talk about the benefits of open sourcing your software, but it ended up being more like a lightning talk. Lessons learned: 1) no matter how much you think you have to say about a subject, having the speaker notes is still very important (to me) and 2) a bit more preparation, updating the talk given my new role, would have been extremely beneficial - as it was, I cut a lot of the content on the fly and had nothing to replace it with. Oh well, you live and learn. I'm glad I had a week of intensive MongoDB training the week before, I could actually answer all the technical questions thrown at me - yay me! It's true that educating people is a really good way to learn stuff. People are really interested in MongoDB. Many are using it already, but even more are wanting to learn about NoSQL in general, and Mongo specifically. 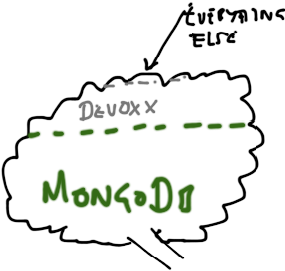 It was really awesome that Stephan gave a massive boost to Mongo's reputation, describing how the central data store for the conference technology was MongoDB running on a Raspberry Pi. You don't get cooler than that. Numerous other speakers gave very positive stories of using MongoDB too, so we had a lot of people stop by the stand to ask us what it was all about. Although I was nervous of being on the stand after Ceri's experiences, I didn't notice anyone doubting my ability as a technical person despite being of the female persuasion I only had one conversation where the (male) developer I was speaking to kept addressing his questions to the (non-technical) (male) sales person instead of me. But that's fine, I just kept answering the questions, and maybe I've made a slight dent on his (clearly subconscious) assumption that women aren't techies. I still think the best way to address problems like this is to keep persevering, keep being visible, and to not let your assumptions about what other people are thinking override your own confidence in your abilities. Robots seem to be cool again, and I, for one, welcome our new automated masters. 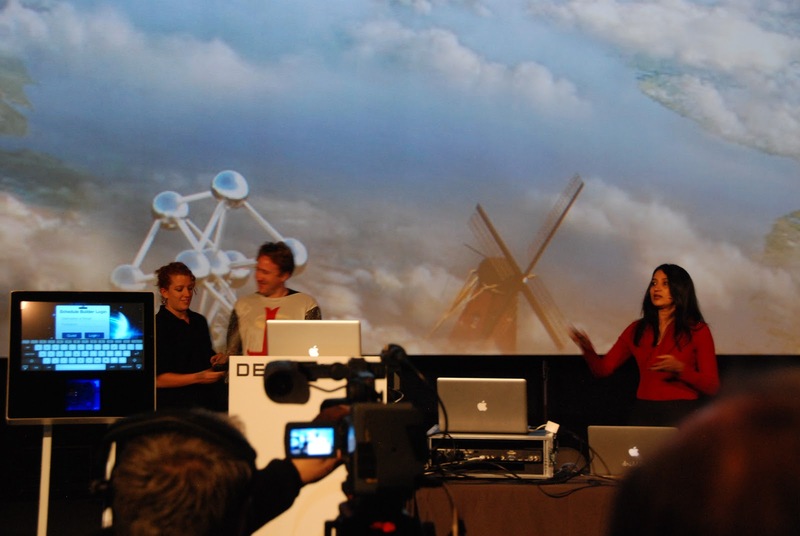 I was totally blown away by the choreographed dancing robotos on stage as a lead up to the keynote. I think the only way to top that for Devoxx UK is Robot Dancing Tyrannosaurus Rexes. On caffeine. Destroying Lego cities. The moral of today's story - be careful what you wish for. During the normal course of my life, it's filled with Stuff. Early in November, 10gen ordered me to go to New York to learn about MongoDB (Oh No! My Life Is So Hard!). I was looking forward to shopping and taking photos of the devastation wrought by Sandy, but actually I spent the whole time drinking from the firehose of MongoDB information provided by my ridiculously smart, ridiculously well-informed colleagues. (I didn't even buy shoes! But I did buy a new winter coat, so there is some balance in the world). 24 hours after landing back in in London, I was on a train on my way to Antwerp for Devoxx. 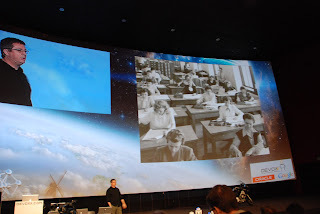 There, I did three talks, including a new talk on Agile, co-presented with a colleague from LMAX (a teeny snippet of which can be seen in the video on the Devoxx home page). Running from thing to thing, helping out at the 10gen stand and meeting new people and those I count as friends kept me pretty busy (did I mention My Life Is So Hard?). ...and now I'm at Skillsmatter Scala Exchange, writing a blog post instead of listening to the talks. Because I've got no more space in my brain for anything, let alone a new language I haven't studied at all (don't tell anyone). Fortunately I'm not travelling again for the rest of the year, so I'm hoping to start doing some Actual Code some time soon. I have one last conference, the LJC Open Conference this Saturday, which fortunately is on home ground. If I can get away with it, I'll go and watch other people talk rather than perform myself. For any LJC guys reading, you can submit talks in advance, or suggest topics you want to see. 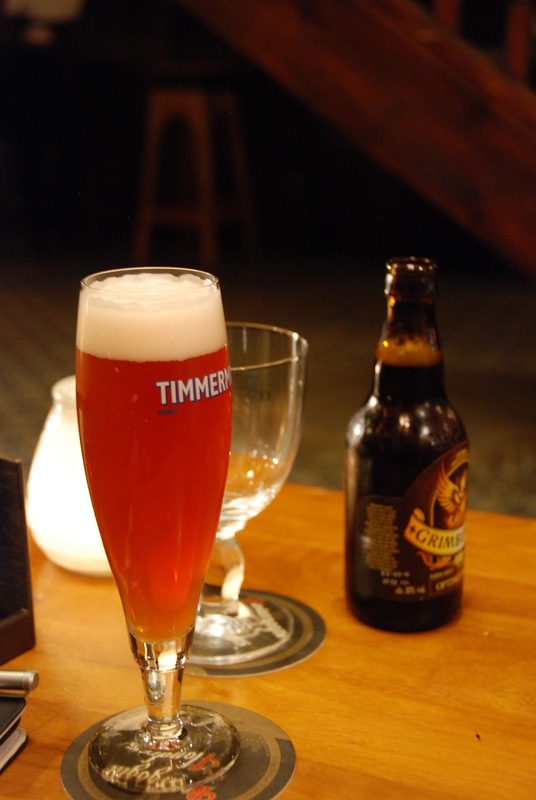 This week I'm at Devoxx for the whole week, and already I've achieved two things I didn't manage last year: I drank Belgian Beer and I've spent some time in Antwerp itself. Wed 17:50 - Agile++: When Agile Goes Well - Co-presenting with one of my ex-colleagues from LMAX. Thu 17:50 - The Problem With Women: A Technical Approach. When I'm not talking, you should be able to find me lurking around the MongoDB stand, or at the various after-conference events that involve alcohol. On the same day Stephen Chin came to see me at the 10gen offices, we also ran a NightHacking session in the evening with the London Java Community. Not many people turned up (maybe I need to work on my signage to the office?) but it was a great session. In fact, having less people meant we could all be involved. Expect Raspberry Pis and JavaFX.